Welcome to the Unitarian Society of Hartford! As Unitarian Universalists, we strive to engage in a “free and responsible search for truth and meaning”. A key purpose of our religious education program is to provide a framework for our children as they begin their path of lifespan faith development. As such, each of our classes is designed to include a wide range of religious and philosophical traditions, and to integrate a variety of learning styles. We welcome all families and children, including those with special needs, and will make every effort to accommodate all children in our program. We encourage families to visit our classrooms to determine if our program is a comfortable fit for your belief system. To arrange a visit, please contact our Director of Religious Education at: DRE@ushartford.com or 860-233-9897, x104. Become responsible persons who are able to make ethical decisions through which they show their care and concern for all humanity. Promoting practices that are in harmony with nature, the environment, and the sacred circle of life. Our children are taught to think for themselves, while receiving guidance on moral and ethical behavior. We allow their individual beliefs to unfold without any dogma. Our children will learn that all big religious questions have many answers, and that it is their duty to search responsibly for their own truth. Ultimately, we want our children to become mature adults who make their own decisions about what to believe and how to live. Most Sundays, prior to classes, the children join the congregation in the sanctuary for the first 10-15 minutes of the service. This is a time for the children to be part of our spiritual community, and to witness the rituals of the liturgical year. A children’s message, or “Time for All Ages” is offered by our Director of Religious Education, designed to complement the adult sermon. 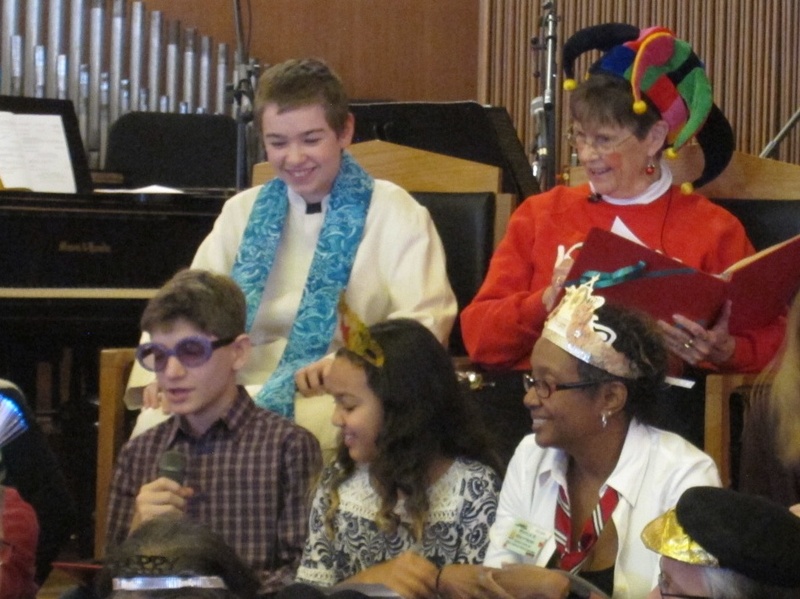 Holidays and holy days are often celebrated with a multigenerational service, during which the children are invited to participate in the entire service in lieu of classes. These services are designed to speak to both adults and children, and to reinforce our connection as a spiritual community. On the first and third Sunday of each month, childcare is available after worship until 1:45PM for any children under the age of 10 whose parents wish to participate in meetings, coffee hour, or other post-service offerings. Once a month the youth and children gather in the chapel in lieu of the sanctuary before classes. The time allows for exploration of what worship means and allows them to participate in meaningful ways. They sing, light candles, play instruments, dance, and share readings and poems. In addition to our regularly scheduled classes, we also offer dedication services for infants and children of any age as well as Coming of Age and Our Whole Lives for our middle school students. Once every 4-6 weeks we also encourage our children and youth to explore their creative side by offering a variety of one-room activities. This includes such things as incorporating drama and the arts, music, learning to respect and cultivate our environment and cooking and crafts. We are a family friendly congregation. Most of our events are appropriate for families of all ages or provide free childcare. Please look for this symbol in our programs booklet or when looking to attend events. Our religious education program strives to give children the necessary foundation for this lifelong task by providing a supportive, structured environment that allows them to focus on the 7 Unitarian Universalist principles in an age appropriate fashion. Drop off 10:15 & pick-up at 11:45am. Pre-K-2; 3-5; 6-8 and High School Youth Group meet during the worship service. Once a month we have a Chapel for Youth and Children in the Payson Miller Chapel where the youth and children learn about and lead the worship before heading off to class.